My story The Empyrean Light from Conjunctions:71 A Cabinet of Curiosity is available to read online. Or you can buy the full issue in trade paperback book format at selected bookstores or online here. Here’s an amazing concept design by artist Leilani Joy for The Scout from my story The Tale of the Scout and the Pachydormu, out now at Beneath Ceaseless Skies. 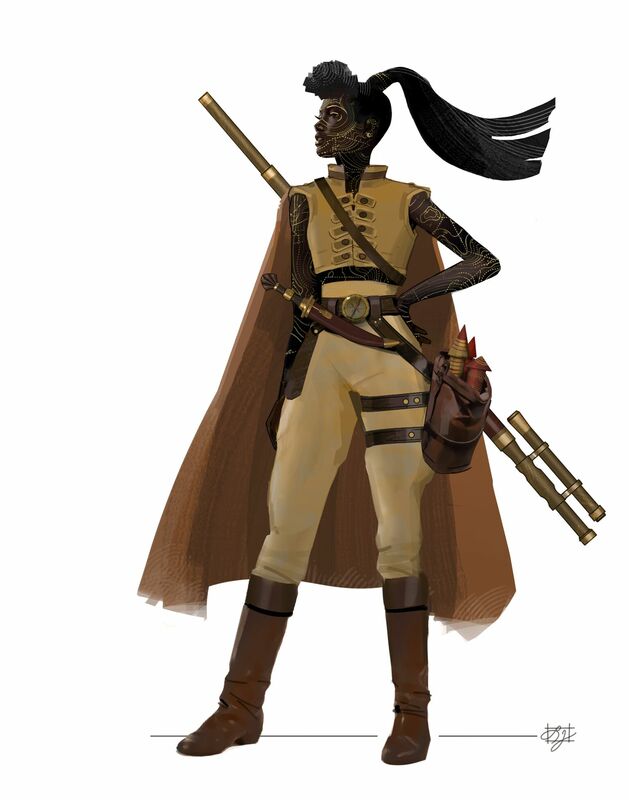 Like you, I grew up with the telling of the Tale of the Scout and the Pachydormu. That telling, on the night of first new moon of winter, marked my years between toddler and twelve like tree rings. The warm spice smell of the Butter Punch, the weight of that punch on your tongue and in your throat, the sugar crunch of the cookies–the slumped star of their legs and heads, the soft meringue of their shell hiding a spoonful of jam or a candied nut or the startling crackof the one uncooked bean that appointed the finder the night’s Governor–the giggles and gasps as the night’s Governor was hefted overhead and passed hand to hand around the room, the soft-hard of flannel blankets quilting the floor, pillowcases still filled with last year’s smells and last year’s crumbs, the knock and groan of the radiators whose warmth grew more welcome as the night stretched out. And of course the soft solemn tones of ‘Uncle Willow’ reciting the Tale. 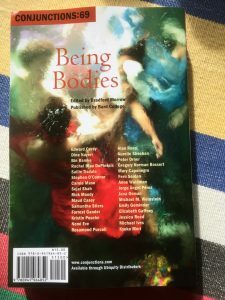 I’m absolutely delighted to have sold my weird Weird short story “Left Hand Jane” to Conjunctions, for their Fall 2017 issue on the theme “Being Bodies”. 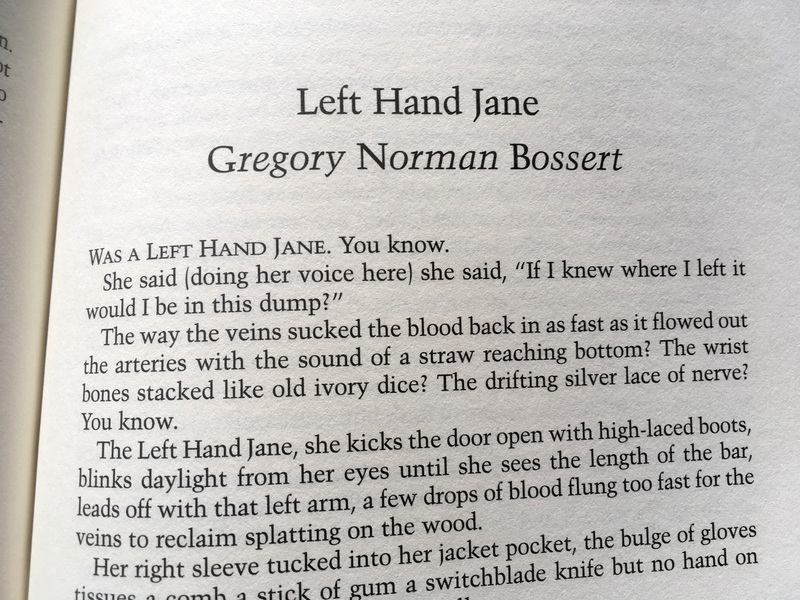 Was a Left Hand Jane. You know. She said (doing her voice here) she said, “If I knew where I left it would I be in this dump?” The way the veins sucked the blood back in as fast as it flowed out the arteries with the sound of a straw reaching bottom? The wrist bones stacked like old ivory dice? The drifting silver lace of nerve? You know. 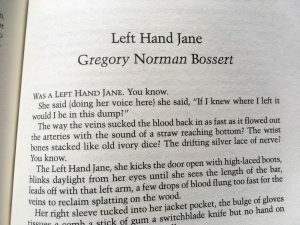 The left hand jane, she kicks the door open with high-laced boots, blinks daylight from her eyes until she sees the length of the bar, leads off with that left arm, a few drops of blood flung too fast for the veins to reclaim splatting on the wood. Her right sleeve tucked into her jacket pocket, the bulge of gloves tissues a comb a stick of gum a switchblade knife but no hand on that side either. A trained eye can tell. My short story “Goner” is out now in the March/April 40th Anniversary issue of Asimov’s Science Fiction magazine. There had been no sounds from his mom’s room for twenty minutes, so Char fished his sneakers out from under the bed and carefully slipped the splinter from under the strap. It was as long as the last joint of his forefinger, dry and strangely soft, and of a black so deep all detail was lost even to the macro vision of his phone. Under that magnification, one end was flatten and fractally fuzzed, like a feather. The other end tapered to a point so fine it had no visible end; it faded from view like Mr. Clark had done this morning, flung to the sky. Char had found the splinter on the skylight dome where it lay cracked on the Clark’s deck. He had almost said something but had instead slipped it into his shoe, proffered up the plastic dome instead. It’s not like Mr. Clark could glue the splinter back on, Char thought later. Char touched his fingertip to the splinter’s point. 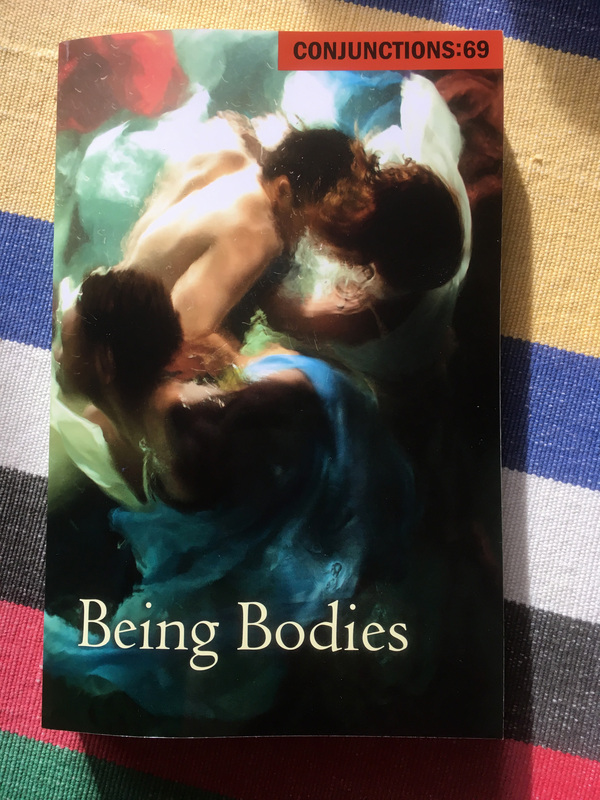 There was no resistance, no sense of puncture; the point simply slide through the skin into his flesh. So smooth was that penetration that the splinter slipped almost all the way in, and something in its structure resisted Char’s attempts to pry it back out, even with tweezers. He finally wrapped his fingertip in band-aids and went to sleep and dreamed of looking up at a night sky through a rectangle of glass that mirrored him all in black.